Denver, Colorado, the "Mile High City", is a melting pot for every kind of youthful person, including gays and straights. Denver Pridefest celebrates and promotes the gay and lesbian alliance in the city. Gays are accepted in this youthful atmosphere and there are many clubs, bars, restaurants and organizations oriented toward the lifestyle. Denver has an unusually beautiful setting with the Rocky Mountains towering overhead.Denver University is one of the major colleges in town. The City and the County of Denver has close to 600,000 residents and about 2.4 million in the Denver-Aurora metropolitan area. Outdoor recreation is superb, and there are many cultural things to do when the sun, which shines here 300 days a year, goes down. The area has a relatively mild climate compared to the mountains nearby. 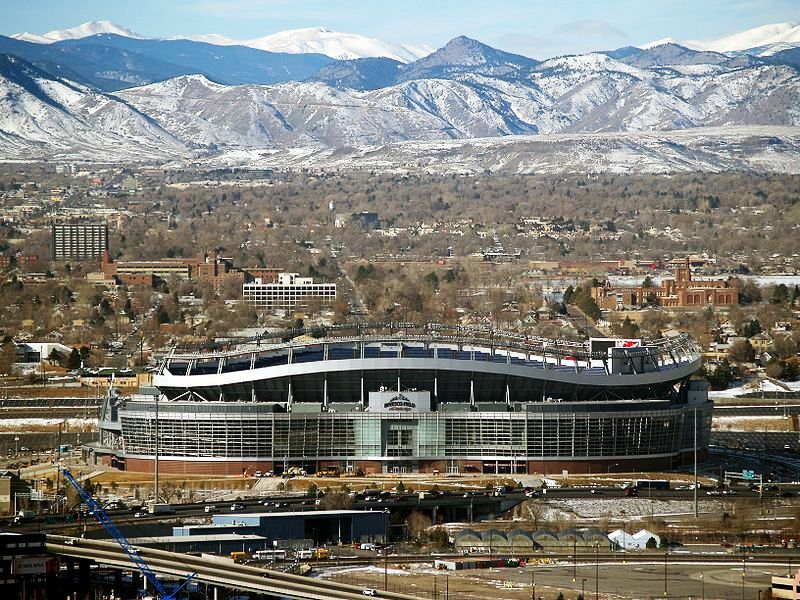 It stands at exactly one mile above sea level - 5,280 ft. Photo of Invesco Field courtesy of Wikipedia and David Shankbone. If you want to live in an eclectic, vibrant, and urban area of Denver, you should consider the Capitol Hill neighborhood. Just outside the heart of downtown Denver, Capitol Hill offers residents the ability to walk just about anywhere, including stores, restaurants, park, public transit, and more. There are fewer new developments here, but many of the older buildings have been rehabbed. For active adults it can be the best of both worlds; city living with convenience. Denver was not affected as severely as the rest of the nation, particularly the southwest, by the 2009 housing crash. Real estate is more expensive than the national average, with the median sale price at $450,100 in the 3rd Quarter of 2018 in the Denver-Aurora-Lakewood area, according to the National Association of Realtors, up from $418,100 a year earlier. City in a mountain setting; Unusually beautiful and extensive parks (200 of them!) and 28 recreation centers; parks outside of the city such as Red Rocks Park and Winter Park Resort ski area; The Rocky Mountains overhead; The Brown Palace Hotel; a full range of cultural and sporting opportunities; One of the world's best airports; every type of active adult housing choice. Very rapid growth and a big city. Denver at 5280 ft. elevation is located in the South Platte River Valley where it meets Cherry Creek; it is just east of the Front Range of the Rocky Mountains; the approach from the flat ground of the east is quite dramatic - at first you just see the mountains and then you see the city nestled at their base; the city gets about 250 days of sunshine a year and can be quite warm even in winter. A Scientific and Cultural Facilities Tax helps fund cultural and scientific facilities in the city; there are 3 opera companies and 3 dance companies operating in Denver; prominent cultural and scientific institutions include the Denver Art Museum, the Denver Botanic Gardens, the Denver Mint, Denver Museum of Nature & Science, and the Denver Zoo; the LODO area has an active music scene; the University of Denver offer a number of cultural programs; Red Rocks Amphitheatre is a world famous outdoor concert venue on Denver’s western edge; great new library. Crime in Denver is slightly above the national average. There are more than 25 hospitals in the Denver area, many of them leading research institutions. 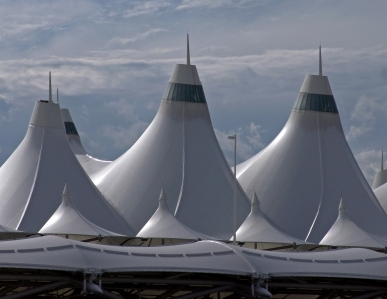 The Regional Transportation District operates more than 1000 buses and five light rail lines; Denver has an ambitious $7 billion dollar program, FasTracks, to add 122 miles of passenger rail by 2016; Amtrak has service to Chicago and Los Angeles; Denver International Airport is new and is the 11th busiest airport in the world; Discount airline Jet Blue operates from Denver. Many sections of Denver are very walkable.